We went to get our Christmas tree today. Only problem: I can't find our Christmas decoration stuff. It's probably still in storage somewhere after our last move, though I was convinced I brought everything home. I hope the box will still show up, but for the time being I had to come up with something else. As we have quite a collection of Christmas ornaments by now, just not in the right place, I didn't feel like buying even more. 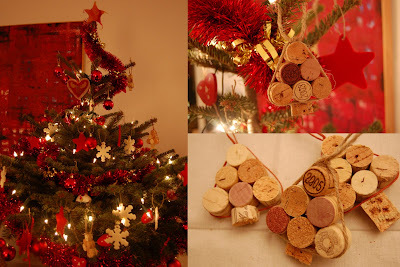 So, I checked my craft supplies and came up with these: Christmas tree ornaments made from wine corks. A fast and easy craft! 2. Glue the pieces together, working by rows (first 3 then 2) and next glue the rows together in a 3-2-1 triangular setting. Glue on the tree trunk. 3. Take some wire, thread, ribbon, ... and work it around your tree. Make a tight double knot at the top and use some glue to fix it. Make another knot so you have a loop to hang up your ornament. You could probably skip this part and just thread some wire through a hole you make at the top of the tree. I left my trees the "natural" way as I liked the differences in color and the stamps some of them had, but you could easily further decorate them or have your kids decorate them with paint, glitter, pompoms etc. We didn't have enough time to decorate our tree tonight, but we'll do it tomorrow after school. Depending on the result I might post another picture - I'm getting worried all of the sudden that the ornaments might be too heavy for our poor tree, though I'm sure, in that case, we'll find some other use for them... Why not decorate Christmas presents with them? Update: We finished decorating! And we all like the way our tree looks! I did find some ornaments after all - not the ones I was looking for - but we do have plenty!